Google’s Motorola Mobility arm has continued to post declining revenues, despite new smartphones such as the Moto X and a new family of DROID devices on Verizon Wireless. Still, Motorola will continue to push forward. 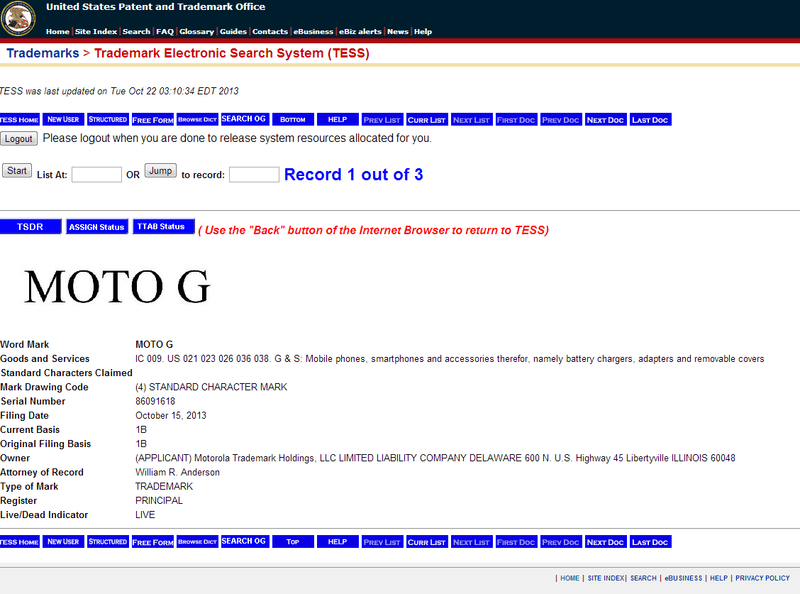 Over at the United States Patent and Trademark Office, the company recently filed a trademark something for the “Moto G” name. There is no telling yet exactly what this new label will be given to as the description covers “Mobile phones, smartphones and accessories therefor, namely battery chargers, adapters and removable covers.” It seems plausible the Moto G could follow in the footsteps of the Moto X, but we don’t have enough concrete evidence to draw the conclusion just yet. I’m leaning more towards a Google Edition of the Moto X featuring Nexus style vanilla Android and selling exclusively through Google Play, not unlike the Samsung Galaxy S4 and HTC One Google Editions. That’s just purely speculation though, so don’t take my word for it. Moto “G” for Google does make sense though. We’ll have to wait for an official word from Motorola to know exactly what it has up its sleeve next for one of the year’s best smartphones.